This is McCullum's farewell game while Sandeep Lamichhane is set to play for the Stars. 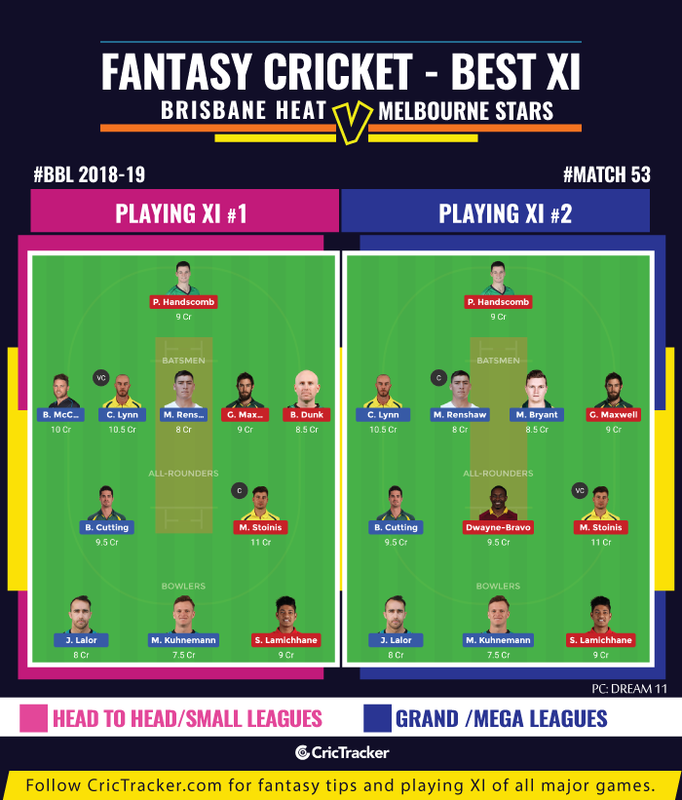 In their last league game of the BBL 2018-19 season, Brisbane Heat will host the Melbourne Stars. The qualification scenario seems to be a very difficult one for the Heat. There are several permutations and combinations that will go in for them to enter the semi-final. They’ll want to give themselves the best chance by winning this game in the first place. Then, the Sydney Thunder should lose their next game against the Hobart Hurricanes or win it by a minimal margin. Furthermore, the Stars should lose their last game against the Sixers at all costs. But, if Stars win this game, Heat and Thunder will be knocked out of the tournament. This encounter, in all possible likelihood, could be the last BBL match for Brendon McCullum. The 53rd match of the Big Bash League (BBL) 2018-19 will be played between Brisbane Heat and Melbourne Stars at the Gabba in Brisbane. The match starts at 7:40 PM local time (9:40 AM GMT) (3:10 PM IST). The matches in Brisbane aren’t high-scoring ones. Toss plays an extremely crucial factor here as the pitch behaves a lot better for batting in the second innings. Chasing teams have won on three out of five instances here. Chris Lynn (C), Max Bryant, Brendon McCullum, Jimmy Peirson, Matthew Renshaw, Alex Ross, Ben Cutting, Matthew Kuhnemann, Josh Lalor, Brendan Doggett, Mitch Swepson. Bench – Jack Prestwidge, Mark Steketee. Ben Dunk, Marcus Stoinis, Peter Handscomb, Glenn Maxwell (C), Nic Maddinson, Dwayne Bravo, Evan Gulbis, Sandeep Lamichhane, Adam Zampa, Dan Worrall, Jackson Bird. Bench – Seb Gotch, Jackson Coleman. Sandeep Lamichhane returns to BBL after Nepal’s tour of UAE. He replaces Liam Plunkett in the squad. Matt Renshaw’s last four BBL scores are 90*, 15, 0, 45 (starting from the most recent game first). He scored an unbeaten 90 off 50 balls with 9 fours and four sixes in the last match against Adelaide Strikers to keep the hopes alive for his team. Marcus Stoinis is a sure shot as captain or vice-captain. Chris Lynn, Matt Renshaw and Glenn Maxwell are the options you can consider for captaincy. For vice-captain, you can pick between Brendon McCullum, Ben Cutting and Dwayne Bravo. Peter Handscomb, Ben Dunk and Max Bryant are the alternative options as the multipliers. Bowlers – Josh Lalor, Matthew Kuhnemann, Sandeep Lamichhane. The Brisbane Heat are expected to win the game.